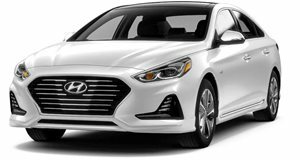 The base price for the Hyundai Sonata Hybrid is $25,500 for the base Hybrid SE trim, before incentives, tax, license, registration, and an $885 destination fee applicable on all models. The second of two trims, the Sonata Limited Hybrid, is the luxurious option, priced at $30,500. The Limited model also offers the only optional features package available, the Ultimate Package, for an additional $3,850. At present, Hyundai is offering $2,000 cash back on any Sonata Hybrid SE and Limited models purchased from dealer stock before 31 January 2019. The Hyundai College Grad Program offers $400 towards the purchase or lease of any new Hyundai Sonata Hybrid, valid until January 2, 2020, for anyone who has graduated within the past 2 years or is destined to do so within the next 6 months. Proof of education and current/future employment is all that’s required to qualify. Hyundai’s Military Program says thank you to all those in service, and applies to any active duty, reservist/national guard, veteran, and retired US military personnel, entitling them to $500 additional credit towards any new Hyundai Sonata Hybrid before 31 May 2019. Hyundai’s Mobility Program takes care of those who require special vehicle modifications in order to drive. The Mobility Program reimburses up to $1,000 to cover modifications required, and is valid until January 2, 2020. At $25,500, the base Hyundai Sonata SE Hybrid features decent standard equipment including impressive safety features and is priced in line with rival hybrid sedans. The second of two, and top specification Limited trim sets you back $30,500 as standard, but has the option to add a $3,850 Ultimate Package unlocking higher specification infotainment, greater levels of comfort, and the full range of safety features available in one all-inclusive package. Even with the Ultimate Package, the Sonata Hybrid still comes in at less than the top-spec Honda Accord Hybrid. The Sonata Hybrid offers just two trims, with only one single options package available on the range-topping Limited trim. The Ultimate Package for the Hyundai Sonata Limited Hybrid comprises automatic emergency braking, lane keep assist, smart cruise control automatic high beam assist, driver attention alert, rear park sensors, heated steering wheel, rear window sunshades, an 8-inch touchscreen navigation and infotainment system, Infinity premium audio with 10 speakers and a subwoofer, and wireless device charging for compatible smartphones. These features are not available individually, or on the base SE trim and the Ultimate Package is priced at $3,850 – a worthwhile investment for the extra safety and convenience they afford.